Welcome to Robot Shark Attack Game 2018: Angry Shark Games, newRobot Shark game! Be gigantic killer shark that kills people ortransform into a crazy robot and chase them to kill. 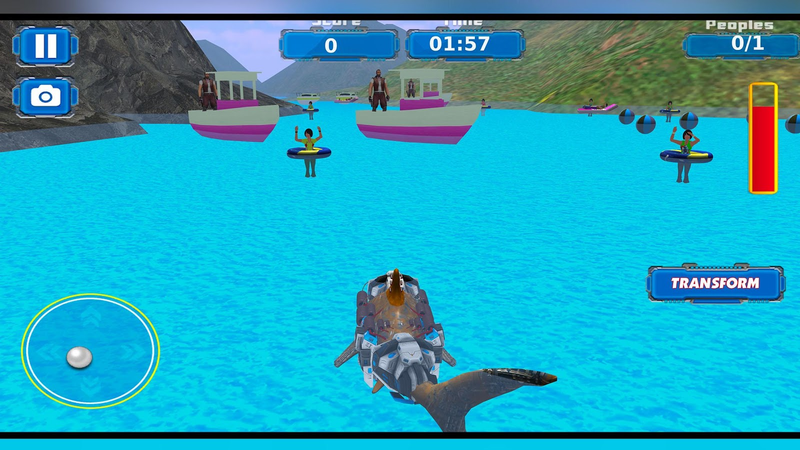 This SharkAttack Game also has underwater level that you will have to unlock.Complete missions and dive into the ocean! Under the sea you willmeet all kinds of fishes – blue fish, tropical fish, puffer fish,tuna fish, as well as beautifull designed ocean bottom with coraland jellyfish. This is like a fish market for your killer shark!Your angry shark can start to swim in deap sea and eat them all.Begin fish mania and chase them around to catch little fishes. Makesure to stay out of big bombs! Notice a bomb floating in the oceanwater - you don’t want it to explode! You can even transform into arobot also and be mad robot who swims! Moreover, take care of bloodlevel! Don’t stay out of blood or you will die. People are scaredof sharks cause they can smell blood miles away. When they come onvacation to the coast, they tend to swim and rest on the beach.Some girls swimming, some man sail boats, or boys playing with ballnear the coast. They all think they will have peacefull summervacation. And then out of nowhere, they notice a beast swimmingtowards them! They all start so scream and run! The panic at thebeach! As an angry shark you have to be fast and catch them. Shurkhunting starts immediately! As a big fish you will be noticed soon.But you can also transform into a robot and be less obvious. Coastguard will let everyone know a shark is near as soon as they seeyou. Be faster and catch them before that. Kill people on the beachor people in water. You can also kill people motorboating or atpowerboat. When you see a ship, just jump out of water. Many peoplehave phobia of sharks for a big reason. Not only that they are bigfish and they can kill you in a minute, they also sometimes trackerboats when they are hungry. There are many shark species, and allare dangerous, hammerhead shark, tiger shark, the great whiteshark. Biggest shark is whale shark and Megalodon was the biggestshark that ever lived. Use your imagination and imagine shark turnsinto a giant robot! Cool, isn’t is? People would freak out andpanic! Eat all fishes and don’t be hungry fish! Even transform intorobot in ocean mode. Robot transformation is amazing designed.Robot swimming is so cool as well as robot fish hunting! When youcatfish you eat it and blood spreads around the ocean water.Features: * Coolest Robot Shark Game that you can play for free *Transform into a big robot or transform into a crazy shark * Killscared people at the beach * Complete the missions and go to playunder water game * Catch fishes under the sea and eat them all *Don’t explode big bombs under the water, explosion can kill you *Swim fast and kill all little fishes and big fishes * Be a robot ora shark robot * Transformation under the water is also a choice Howto play this Robot Shark Game? 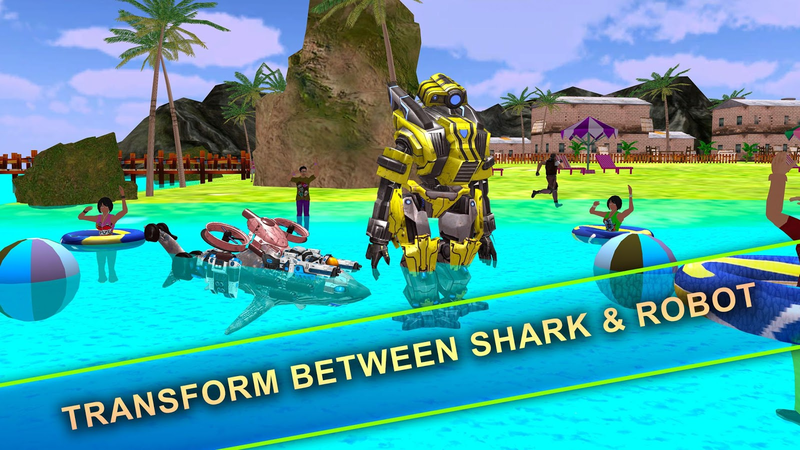 * Download this free Robot SharkGame * Start from the first level and complete your firs mission *You are a shark robot and you have to kill people on the beach *People are afraid of sharks and they will scream as soon as theysee you * Transform into a big robot and hunt people * People willtry to run away, catch them before they do * Kill girls swimming,boys playing with balls and people who rest on the beach * Unlockunder water game and play as a gigantic shark or crazy robot *Transform into a shark or robot anytime * Be fast and kill allfishes * Don’t stay out of blood level * Watch out of bombs underthe see * Eat as many fishes as you can * Be angry shark and madrobot, watch amazing transformation Download this crazy RobotsShark Game for FREE now! Play as a shark or as a robot, transformanytime! Kill every human and fish! You will in a lead role and playing as a Superhero Monster Robot.There are enemy robots who are trying to destroy this world and itis up to you to save the world by destroying them. Go find therobots and kill them before it is too late.You have clock tickingand the time is very less, Go in all directions and you will findenemies, Be a Superhero and chase your opponents. This is a War andits for the safety of society. The enemy will try and do anythingto destroy this world as they are from outer space.The worldcompletely rely on you and thinks you are the only Saviour. Youhave the Extreme super powers which will help you convert toMonster Truck and chase the culprits. Once you reach near the enemyjust hit them to destroy.The target is shown on top and time isalso limited. So Complete the required target to fail their missionand make it impossible for them. You are a futuristic robot and farbetter than a regular Flying Robot, You don't need to fly as yourenemies are on ground. Try to chase, hit, shoot, kill and save theuniverse and be an Universal Superhero.How To Play:* Once the gamestarts the enemy will run away, Click the transform button toconvert* Chase your opponent in any direction, as they are all overthe city* Destroy them and save the world. Special mech under your control: half submarine, half bot. Walk orswim! • Open world: ocean area with island town ashore at yourdisposal. Explore depths or sun your irons on the beach. •Different enemies and quests on the seaside and under water. Don’tlet police, military and bandits stop you! Imagine that you’re ashark with terrible jaws, but you don’t feel hungry and don’t needto eat somebody, just need to change batteries, that’s only thesimulator! Show your animal instincts anyway! Control mechanicalshark, search for treasures and attack hostile robots. Real futurepirate action! End fishing break and start epic sea battle, be rawfish with attitude! Tap and dash! We Bring Robots back to life! In this real robot mechanic game wegive you a chance to repair the real robots which can transformtheir selves into a car like carobot. As a real robot mechanic youneed to replace the damaged parts of the futuristic robots likearms, legs and their electrical wires with a sim toolkit. You canpaint the real robot and also repair, install, test and maintainthe robotic equipment. Modern repairing workshop is fully equippedwith automatic tools like paint spray gun, computerize robotchecking machine and welding machine.Disassemble and reassemblerobots or peripheral equipment to make repairs such as replacementof defective circuit boards, sensors and controllers. This robotgame is different from car mechanic games, bus mechanic games andfrom moto mechanic games, you as mechanical engineer have alifeline for the mechanic workshop and this robot mechanicsimulator specifically let you tune up, customize and modifycomputer controlled robot movements. This is your chance to repairhighly technical robots and become a master of robot repairing.GameFeatures:» Professionally repaired gigantic robots.» Replace orrepair the damaged parts. » Fix and upgrade the futuristic robots.»Various tools to repair robots. » An absolute feast for the fans ofcar fixing and x ray robot games» Realistic repairing garage withall mechanical machines» superb gameplay with smooth soundeffects.» Playable on multiple devices. Dinosaurs are extinct even then you can visualize them in dinosaurgames but the future is of dino robot transforming games. So getready to enter into the world of futuristic dinosaurs that will seta benchmark in dinosaur robot games where dinosaurs are in angerand taking the revenge from the world by destroying all the things.Police cars are in action to control them but these dinosaurs withability to transform into robots are out of control. It depends onyour skills in this amazing game where you as a dinosaur simulatorready to demolish everything. Just play DINO ROBOT TRANSFORMATION,king of dinosaur’s robot games.Game play of this game is attractiveand simple. Dino robot transform game has ten levels. Every levelhas different mission and target. 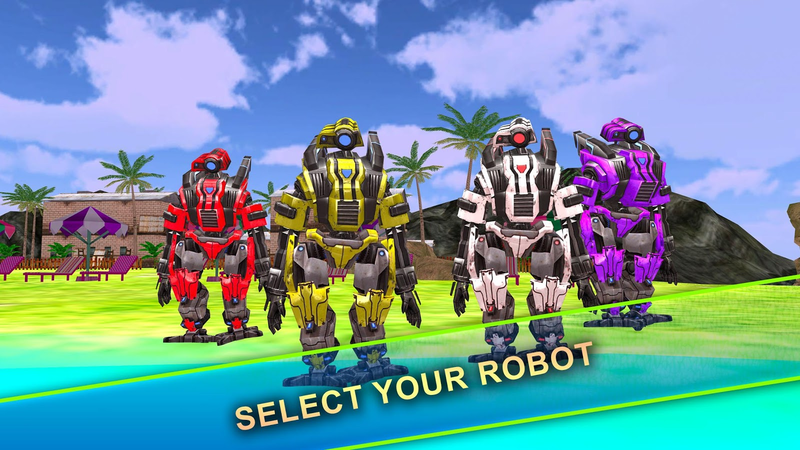 You will fight against carenemies and other moto robots rivals. You can get rid of police carrobots by fire. You have to beat them to get access on next level.You can hit or kick your rivals and throw away. The interestingpart of this game is that you can transform robot into dino anddino into robot anytime then your entertainment will be doubled. Inthis robot simulation game we are also giving you real city driveenvironment.Dino Robot Transformation Features: - Realistictransformation - Different camera view- Thrilling missions-Stunning sounds- Outstanding HD graphics- Superlative car robotssimulation game with dino and excellent city environmentIf you areexcited for futuristic robot fighting and robot transformationgames then you will love futuristic robot battle in this dinosaur’srobot game.Don't waste your time download DINO ROBOT TRANSFORMATIONand have fun. Ready to enter in the world of robot shark and devastate yourentire super villains which are in dangerous robots as well wildsharks in Real Robot Shark Hero vs Super Villain Robots. 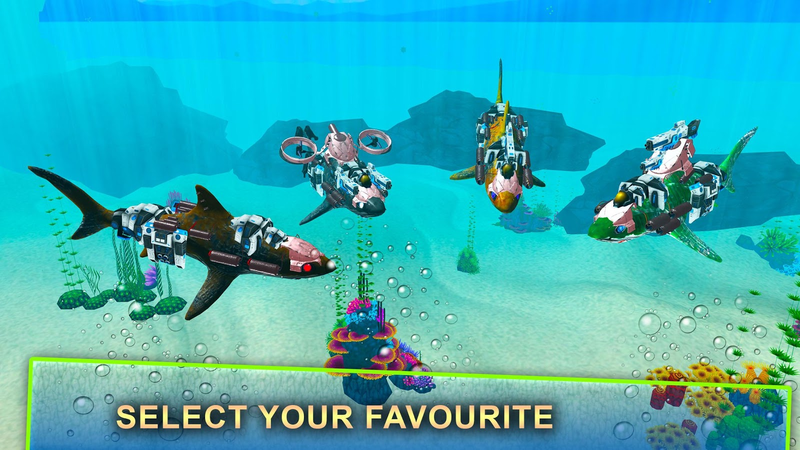 Yourlovely Grand City occupied by these lethal robot and sharks in thisaction simulator. You become the last hope for the survival of thiscity. This game is full of thrill and action where you becomeFuturistic robot hero to save the civilians from brutal robotenemies. With this Real Robot shark Hero vs Super Villain Robotsaction game you explore the battle of robot shark against otherevil robots and beast sharks. All the real fight and action youdiscover in this robot shark simulator is unique experience foryou. The best thing about this modern shark robot fight is the bestcombination of being a machine and the ocean giant use for thisaction game. Game Play:Let’s begin the new adventure of Robot Sharkwith this action pack multi hero and destroy your dangerous villainwho is also in shape of Robot shark. Start the game you only playas Futuristic robot because at this stage the shark is taken byevil robots and we have to free shark from them. After this youhave convert into the wild shark who play in deep water and fightwith dangerous Sea enemies like Wild shark. Some new features areincluded in this action Real Robotic shark game like you have 15seconds boost time in which you can destroy your rival with yourUltra power by playing this Real Robot Shark Hero vs Super VillainRobots game. Also you have underwater glass case level and fight inthe deep sea with monster Robotic sharks. In some hard level yourSuper robot did not fly so you have to manage this during fightwith other brutal robots. So enjoy the challenging alteration andfight with your toughest enemy in the form of robot as well as seakiller shark. Thrilling and Fanatic mission are ready to blast thegame in gaming world with the help of futuristic robot alterationsimulation.Real Robot Shark Hero Vs Super Villain Robots Features:•Play as Robot hero as well as Robotic Shark• Enjoy the boost shorttime during fight• Realistic fight between sea beast and Roboticvillains• 3D Graphics with battle environment• Smooth and easy gamecontrols• Interesting gameplay with realistic sound effectsIf youhave the taste of modifying robot game then you definitely findhuge interest in this Real Robot Shark Hero vs Super Villain Robotsaction game. This will amuse you at better expense and by spendingsome time you find addictive to this robot shark action game. Soanyone having interest in these kind of altering adventure offuturistic robots into the dangerous sea Beast bring adrenalinerush during playing this most futuristic adventure of recent times. Are you lover of transporter games? Then you would love this MotoRobot Bike Transport Truck Sim.Get ready transform for an ultimaterobot moto transformation simulator where you will enjoy themagnificent experience of driving and transporting robot moto andcontrolling moto robots on the vast roads of super grand city. Getthis eccentric summation of moto robot transformation withtransport truck games. In Moto Robot Transport Truck, you wouldenjoy the ride of sports bikes and their transform into moto robotsand park them into transporter truck. Your duty is to transportbikes and X Ray robots from one point of the city to the other. Ifyou are a fanatic of robot simulator and bike ride then you willlove to ride on these motorcycle games with an option to convertinto robots, not-revealed in any other transporter games.Game playof this Moto Robot Transport Truck is really a fun. You have toride and transform the variety of sports bike into moto robots andthen control them into the cargo truck, transport van and thendrive the cargo truck transporter towards the truck parking lotunseen in any other transport robot games and transporter truckgames.In Moto Robot transport Truck, city is big, distance is longand there is time restriction to reach out the destination. If youan expert driver of cargo truck games then get ready to take chargein this motorbike games robot simulator towards the truck parkinglot.Moto Robot Transport Truck Features:• Variety of moto bikes toconvert into robots with excellent animations• Amazing detailedGraphics • Amazing Transformation of sports bikes into Robots andRobots in to bikes!• Realistic Truck Driving Simulation • Big 3DCity Environment with massive traffic to have fun• Many cargo andtransport truck, cargo van to drive and experienceGuys, this is anexciting combination of moto robo games and heavy duty trucktransport games. So operate robot moto simulator in the best oftruck transporter games with versatile experience of moto robottransformation. Drive this transport truck on curvy paths towardsthe parking lot to show off your driving skills. Experience thisamazingly supreme transformation from motorbike to robot and fromrobot back to moto gp racing bike in this extreme moto robottransport truck game. This is moto racing experience so what areyou waiting for? Get ready to rule moto transporter truck gameswith this amazing Moto Robot Transport Truck. After the success of US Army Tank Transform Robot we present youthis new and amazing Real Motorbike Transform Robot. The battlestill continues against the invaded robot transformation cars andthe motorcycles into the little big city. Now it’s a big questionwhether you protect your homeland with the motorbike transformationrobot and kill all of them evil robots or just look as a spectatorand gives the fair chance to evil robot cars to destroy yourhomeland. These car bots are extremely dangerous and are ready tokill people, so show no mercy and unleash hell out of them on thebattlefield and destroy all of the war robots and protect thepeaceful city. You have the opportunity to show the world that youare a talented moto rider and a hero in this fast and furiousTransforming games.In this moto robot game, game play is simple buttough as you control your futuristic robot and transform it togrand moto bike simulator. There are lot of different levels, yourgoal is simply to survive for as long as possible as your bikeaccelerates getting faster while putting your helmet on. Thisraceing moto is the insane looking ride with an impressive horsepower. In this real motorbike transformation game, robot morphsfrom a speeding moto bike into an upright gusti robot and moves ontwo legs and unleash its punches and Kicks.Game Features:★ Simplecontrols anyone can control a Bike.★ Stunning graphics and easy tolearn, intuitive touch screen controls★ Transform Real Bike torobot and robot to Real Bike.★ Stunning bike Physics and drive.★Realistic sounds engineered for this moto robot game.★ Differentcamera views. It’s a battle field. Enemies are ready with their troops andheadquarter to defeat you. They are armed with strong weapons andbrave soldiers. Get ready to compete. Your head quarter and avariety of brave mech robots are awaiting you. Choose your armedforce and jump into this battle.Robot Epic War 2017: ActionFighting is an action packed war game. It challenges you to fightand defeat your enemies. Select from a variety of warriors andplace them in combat zone. Before starting the battle, focus onenemies’ force and its placement. Then choose yoursaccordingly.Opponents want to get control on your ground with theirnefarious fleet of robots. Choose and place your warshipsappropriately to claim victory. Make the best use of your dronesand transformers. You can also upgrade your headquarter andsoldiers. Let’s enjoy the most amazing action packed game of 2017! !Robot Epic War 2017: Action Fighting Game Features: • World’s mostamazing Robots and Soldiers!• Amazing Battle Environment!• HighQuality 3D Graphics!• Realistic Explosive Sounds!• Smooth and EasyControls!• Unlimited Ammunition!• Variety of Force: Soldiers, MechRobots, Air Defense, Transformer!